anchester United player of the season David De Gea has reportedly agreed personal terms with Real Madrid this week according to spanish press. De Gea was given a few days break after recent Manchester United match and he flew to Madrid where he spent couple of days before heading back to England where he will be part of Manchester United squad against Arsenal. Madrid base newspaper “Marca” ran a story today about De Gea agreeing personal terms with Real Madrid and only thing left is Manchester United agreeing to the transfer which is believed to be more than £30 million. So De Gea’s visit to Spain was not really a time off as reported in England. Here are some of the personal terms details which were leaked in spanish media. De Gea is set to earn £4 million a year salary (after tax) and the initial contract will be 5 year long. 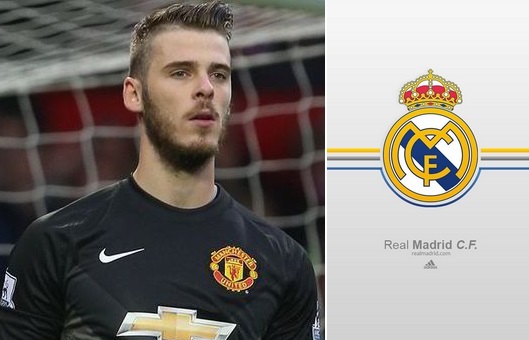 Manchester United were quick to rubbish rumors but as the things stand De Gea’s move to Real Madrid looks very likely if not this summer surely the next one. Manchester United want De Gea to sign a longterm contract and atleast spend another year at Old Trafford but Real Madrid has already made De Gea their prime summer transfer target which means it will be tug of war between two clubs over De Gea. Another sign is Real Madrid wants to buy Marcos Reus of Borussia Dortmund which means Gareth Bale will be sold this summer, who has been strongly linked with United since January this year. So If Reus moves to Real Madrid we can safely assume that United will be looking to land Gareth Bale in a swap deal with De Gea + cash.